NEW for 2015! Our Teleflora exclusive keepsakes include a serving dish, ceramic utensil holder and votive candle holder that your recipient will re-use and cherish for many Thanksgivings to come. You can find these 2-in-1 gifts and more on our Thanksgiving Flowers and Thanksgiving Centerpieces pages. This gorgeous brown glass cube wrapped with a golden metallic leaf is great as a votive holder and much more. Available exclusively from Teleflora. This multi-glazed stoneware utensil holder in rich cornflower blue and bronze is both beautiful and useful – guaranteed to be enjoyed for years to come. Available exclusively from Teleflora. 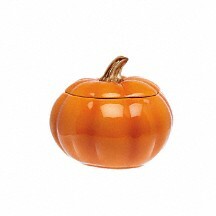 This beautiful hand-painted ceramic pumpkin is another creation from Teleflora’s exclusive Flowers-in-a-Gift collection. Later, it can be used as a charming candy dish – or a striking display piece. Or a vase! Above images show our suggested after-use for your keepsake. Please note that the kitchen utensils, green beans, and candle are not included with your purchase. Tell us how you would reuse your Teleflora keepsake! Exclusive keepsakes include a serving dish, ceramic utensil holder and votive candle holder that your recipient will re-use many times over. Any one of the beautiful centerpieces would be great, I can set my table abound it.